Hello, make yourself at home. 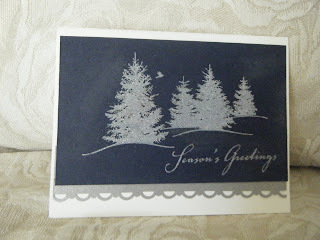 Today I am showing you another card from Stamp Camp. This card was designed by Mel and she saved me some time by making it for me (being I was demonstrating at another table). It's such a pretty card. When you are well acquainted with Stampin' Up products, you can pretty much figure out what products were used. I love that Stampin' Up products are designed to coordinate and compliment each other. That takes the guessing out of what products to purchase and not to mention how easy it makes designing cards and scrap book pages. I like telling you, my readers, the ingredients used for the cards I show on my blog. It's part of my service to you. So, here it goes. I hope you enjoyed your visit today. Tomorrow I will show you another Christmas card. So come on back. Gorgeous card. Amazing we're all already thinking Christmas isn't it, but it feels like Christmas is always in style to me. Love your blog, and your designs are all great. I've browsed a bit, but want to go back through everything more. I'm happy to be part of our new blogging group and look forward to visiting you here! 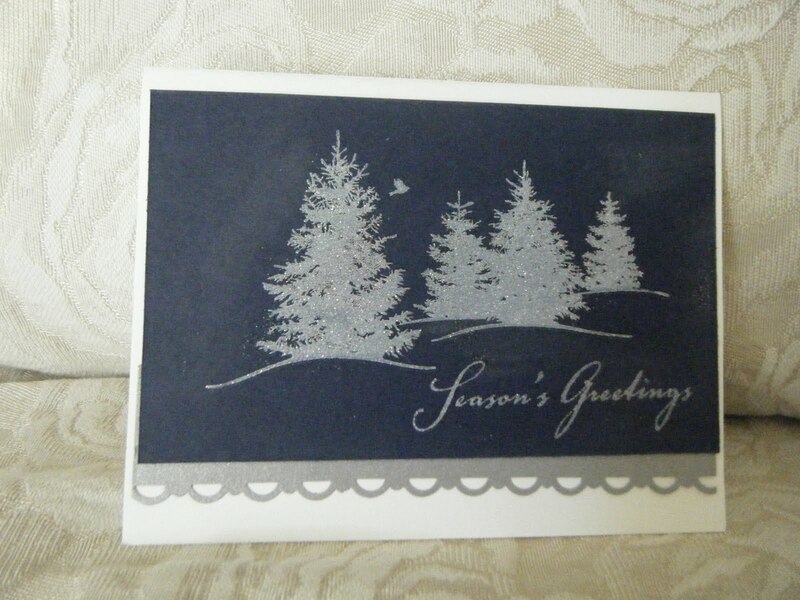 This is so pretty, I always think blue and silver are perfect for these winter or Christmas scenes!! Thank you Diane for visiting my blog. It's so exciting to receive comments too. I'm a newby can you tell. I went to your blog and loved your work and the design of the blog. Hi Tracie, that you for your visit to my blog. I'm happy you liked my christmas cards. I'm already planning (mentally) the next ones. I don't think I have your blog address. Hi Cass, Thank you for visiting. I was at your blog and liked all I say. Very nice blog. Gloria, so sorry I called you the wrong name in my first post...it's me getting used to the new group. Traci, no worries. I'm nervous about all this blogging and now a Group. I am being str e t ch e d ve ry to the max! I'm excited about it though. Love the Lovely as a Tree, I never get tired of it! Oh my, this is stunning! What a beautiful color combo - outstanding! You have a beautiful blog - hope to see more of your creations!